In Electrical wiring we wire dimmer switches for ceiling fans, in this post you will learn dimmer switch wiring with complete explanation diagram. In our last published wiring diagram i published a post about ceiling fan wiring and with dimmer diagram. 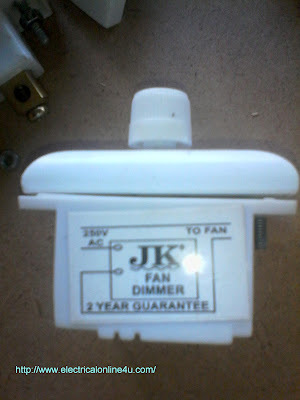 To day in this post i share with you a diagram which i find on a dimmer switch. Last Friday i wired a room in my village and when i am gonna to instill the dimmer switch, i find a wiring diagram on the dimmer switch which was designed my company not by me but it's can help you, and today i am gonna to share this diagram with you. In the above wiring diagram, two terminals of dimmer is shown in which one for input and second for out put. We wired a dimmer in series between electric supply and ceiling fan. So as shown in above diagram one wire goes to direct to the ceiling fan and the second wire go to the dimmer and then to fan. Note that a dimmer will connect in series between supply and fan. If you wire a dimmer and it's not working then change your dimmer connection. Now if you have any question regarding dimmer switch wiring or diagram then do ask me in below comment section.